My name is Tom Ryder. 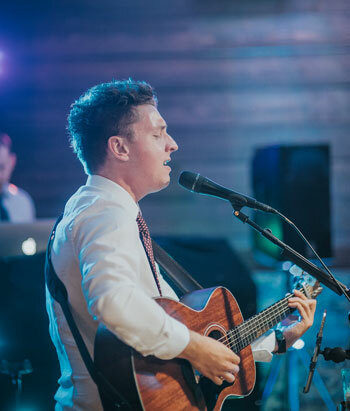 I am a Hertfordshire-based wedding singer providing live music on acoustic guitar and vocals, and I cover Hertfordshire and the south east of the UK. I also travel further afield when requested. I can sing during any part of your wedding, including the ceremony, drink receptions, meal (wedding breakfast) and the first dance. Hertfordshire is where I grew up, where I went to school and where I learned the guitar and played my first gigs, so there is always a lot of nostalgia attached to the area for me. What is perhaps lesser known about the county is the abundance of beautiful countryside and rural areas you can discover. Wonderful architecture and historic buildings are to be found everywhere, and many of these operate as wedding venues. Some of the fantastic venues in Hertfordshire that I regularly perform at include Down Hall, which is on the Hertfordshire and Essex border, as is Great Hallingbury Manor, Sheene Mill in Royston, South Farm in Royston and Fanhams Hall in Ware. For the majority of wedding couples, music is an integral part of their special day, and live music has that extra sprinkle of magic about it. Although there are a number of live music options available at a wedding, an acoustic guitarist and singer is a great solution. The guitar is a very versatile instrument, and while it is common in pop music, it is also possible to rework and strip back dance and house classics and adapt them for acoustic guitar and voice. It is possible to perform all kinds of tunes on acoustic guitar. You can read about my top 5 songs of this year here. Is your wedding in Hertfordshire? Are you looking for a singer? Contact me here for advice about live music on your big day. You can view the services I provide, compare prices, view my repertoire, and read what other couples have said about me by reading reviews and testimonials. Get in touch with me here for help planning your special day.